Is it a space ship? Is it an observation tower? No! It’s a house. 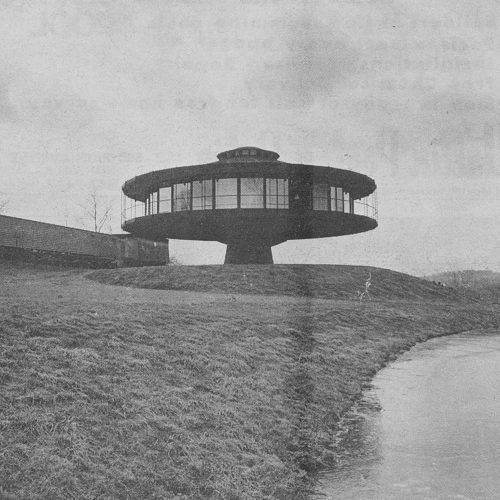 And a superhouse at that, hovering above Pope’s Pond in that Wilton Valley. But it’s not a house for small children, where safety is concerned. Nor does it suit the elderly or infirm. There is a 10-foot climb from entry to living areas. The entry is hidden from view by a high fence at the end of a long driveway. A two-car detached garage faces the parking area. Follow me through for a spatial experience. No sooner are you through the opening in the fence, than you feel the massive weight of the house hovering above. The effect is contradicted by a vast view of the valley before you. It’s like walking under a space-ship, yet it feels strangely medieval. 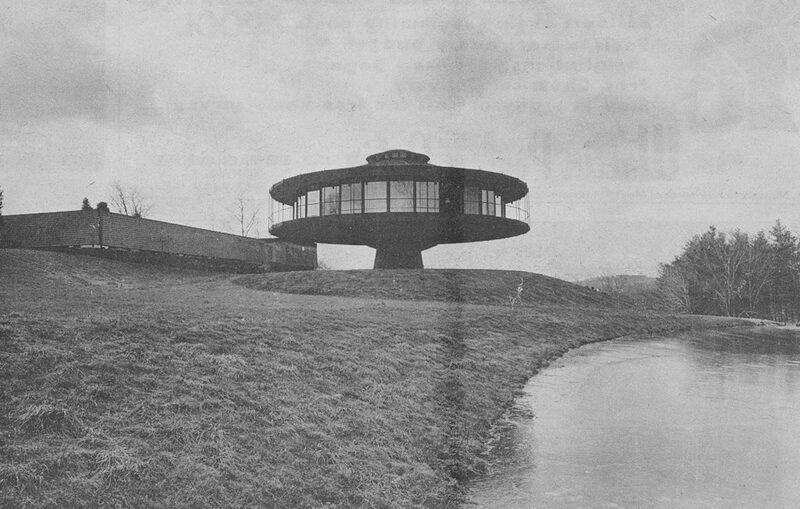 The 72-foot diameter house, its belly shingled in silver-grey, balances on a concrete column, centered and alone in the 4,072 square foot circular courtyard. Thousands of small, grey imported Italian cobblestones under foot heighten the medieval effect. A door, of weathered wood in a niche of the ten-foot column is the only entry, or exit for that matter. Let’s go in. Inside a small round entry foyer, 18 uncarpeted oak treads spiral upward. Grey wool hushes and carpets the curved wall. Jagged rays of light break over a white platform hang-ing several feet below a domed skylight, 32-feet above. Light and airiness suddenly break the confining narrowness of the stairwell, as you step onto a 20-foot rotunda. This is the hub of the house from which all the living areas radiate, like spokes. Part of this core opens directly onto the living room, flooded with daylight and view by eight floor-to-ceiling window bays. 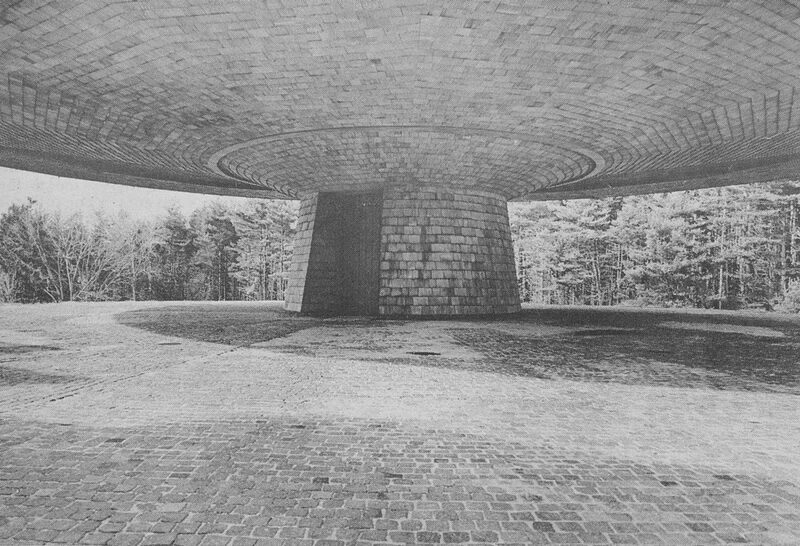 The rest of the rotunda core is surrounded by a semi-circular, grey-carpeted, wall. Four oak doors, evenly spaced in the carved wall, lead to kitchen, dining room, three bed-rooms. three baths, and study. Foster House is enclosed by 30 floor-to-ceiling window bays. Every other bay, 15 in all, are sliding doors. They give each room access to the 6-foot cantilevered deck that surrounds the house. The sheer drop is protected only by an iron handrail and widely spaced posts. Although unsafe for youngsters, the view and sense of freedom up there are magnificent. He has succeeded. The spatial impact of Foster House is exciting and unique. It can hardly go unnoticed, even to the uninitiated. Mrs. Foster calls it “nature’s wallpaper.” Mr. Foster says, “It’s icing on the cake.” Push a button and Foster House rotates in any of ten speeds. Only the center pillar and stairwell remain stationary. Starting at the 4-foot circle of oak flooring which surrounds the stairwall, it turns like a plant toward the sun or, away from a chill wind. Choose a view. Apple blossoms covered tree tops in the valley, their sweet smell waft-ing up. An intimate garden with waterfall. Winter grey trees bowing with the wind. The noiseless mechanism responsible for the rotation is a motor driven ball-bearing assembly, made in Germany and engineered by Rotek, Inc., an American firm. 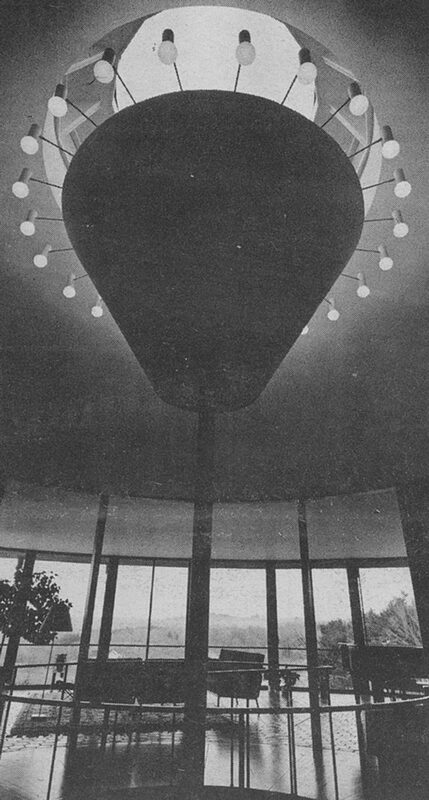 Fourteen-feet in diameter, it circles the stairwell just under the oak flooring. The soffit, the belly of the house which roofs the courtyard, conceals it outside. At the slowest speed, two revolutions per day, the motion is imperceptible. But at speed number ten, it feels somewhat like the Queen Mary. A house needs electrical and water lines; a sewerage system. They connect conventional houses to earth. At Foster House they travel through the central pipe, around which the entry steps spiral, coming out above the platform below the skylight. Concealed from view, water, electricity and telephone lines spread out into each room. The sewerage system is a most unusual engineering feat. The waste pipe runs down the stationary pillar into the usual septic tank located under the terrace. The centrally located waste pipe receives waste from a series of open ‘ through-like structures which circle the core of the house under the floors of the kitchen, laundry, boiler and baths. 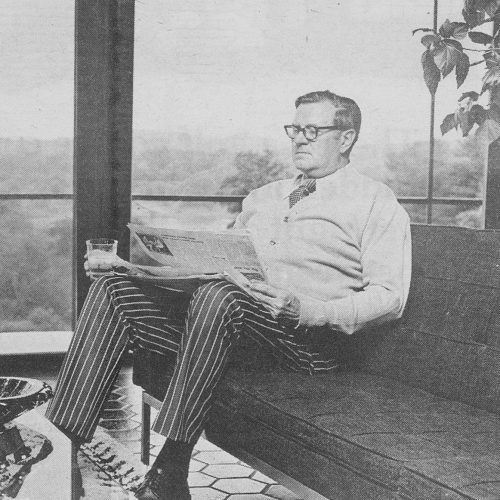 John Plantinga, member of the New York engineering firm, Meyer, Strong and Jones, and a Westport resident, worked closely with Mr. Foster designing the three-cycle sewerage system. With-out it, the house would be con-ventionally land-bound. Foster House is simply furnished. A baby grand stands along one wall of the living-room; a free-standing, rust-colored, iron fireplace along the other. 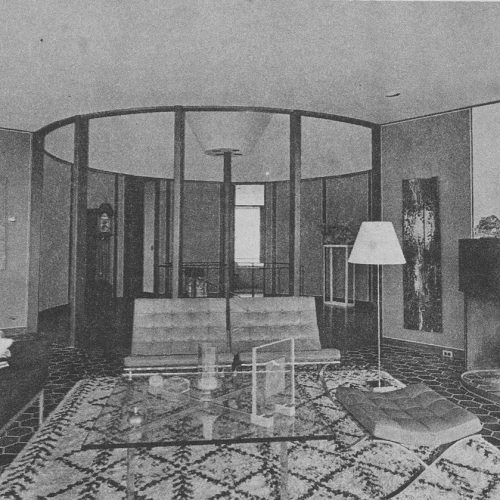 Centered on the brown hexagon, quarry-tile floor is a white Indian rug, heavily tasseled. A pair of Barcelona chairs upholstered in black leather show their polished steel backs to the rotunda hub. A sofa faces the fireplace. A glass and steel cocktail table holds candles and silver bird. Lighting is recessed, rheo-stat controlled, directed at the grey carpeted walls and their contemporary paintings. Two of Mr. Foster’s metal wall sculptures are of exceptional interest. Direct reading light comes from identical floor lamps, conical white shades on thin steel stems. A happy place for the variety of live plants, the living-room measures 48-feet at the window end, 17-curved feet where it joins the rotunda. The 20-foot side walls create a wedge-shape as they angle toward the core. This is a house without the usual clutter of doors. Thirteen rooms are reached through the four doors on the rotunda. The first door leads through a small foyer, to boiler-room, laundry, dining room and kitchen. The dining room with its three window-bays, 18-feet of glass, is furnished with Hans Wegner Danish teak table, chairs and buffet. The kitchen uses three bays, one glass bay is blocked to supply additional wall space. The cabinets, made by Darien Kitchens, have reverse curve, molded, plywood doors at each corner. Saarinen table and chairs silhouette against the expanse of window. The second door off the core enters the master-bedroom wing. Six window bays are evenly divided between bed and dressing rooms. The built-in vanity sink, topped by grey marble, shares a wall of the dressing room with a large closet, matched by its twin on the facing wall. Like all vanities throughout the house, it is 39″ high to accommodate the family’s tallness. A bathroom completes this wing. The children’s wing is through the third door. Two bedrooms and a dressing room share seven window bays. The fourth oak door leads to the study which doubles as TV and guest room. Drapes on windows throughout the house are an off-white, textured casement. They hang from recessed ceil-ing tracks to floor length; four-inch hangers in the head-ing fold flat, eliminating un-necessary fullness when they stack. No ugly baseboards mar the span of glass. Grates, recessed in the floor on the outer perimeter of each room, are the only visible sign of the circulating hot water heating system. Richard Foster wanted a house that enjoyed its view. Four designs were discarded. It was the fifth and final plan that resulted in Foster House. Due to the unusually steep, 30-degree slope of the site, he found conventional designs un-satisfactory. They required large amounts of fill and un-usually deep basements in order to be perched high enough for the view. So he conceived a house like a tree: branches reaching toward light and view, roots never marring the earth. 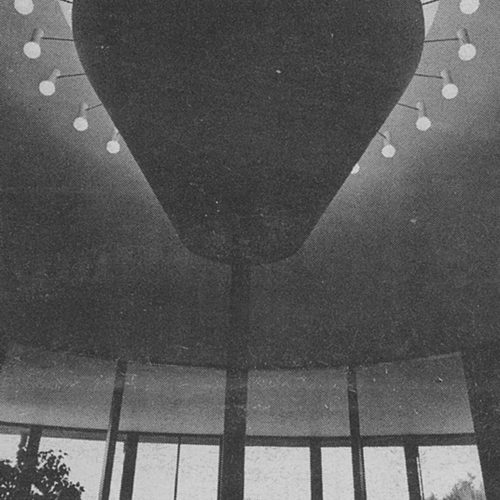 Un-like a tree, however, the 72-foot-diameter house is not sup-ported by its pillar (trunk). It actually hangs from its roof, through an intricate maze of trusswork connecting three steel rings of power. The top steel ring is 10 feet in diameter. It centers over the stairwell, 32 feet above the ground, 22-feet above the floor. The second, or perimeter steel ring, is 60 feet in diameter. It circles the house just above the windows, 19 feet from the ground and nine feet above the floor. The third, or core steel ring, is 20 feet in diameter. 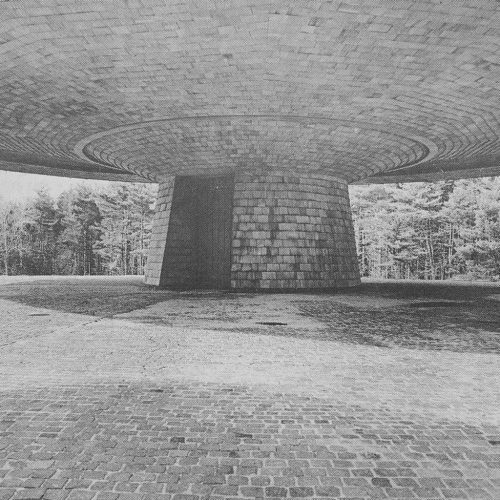 It circles the rotunda on a parallel plane with the 60-foot outer ring, also nine feet above the floor. These three rings are ribbed together with steel. The floor hangs from this umbrella-like, roof structure. Thirty steel columns are the hangers. Fifteen of them connect the perimeter ring above the win-dow to the 72-foot circular floor. These outer steel columns double as window mullions, and give no visual indications of support. Fifteen steel columns connect the inner core ring to the floor, creating the 20-foot rotunda. Three of them are exposed. 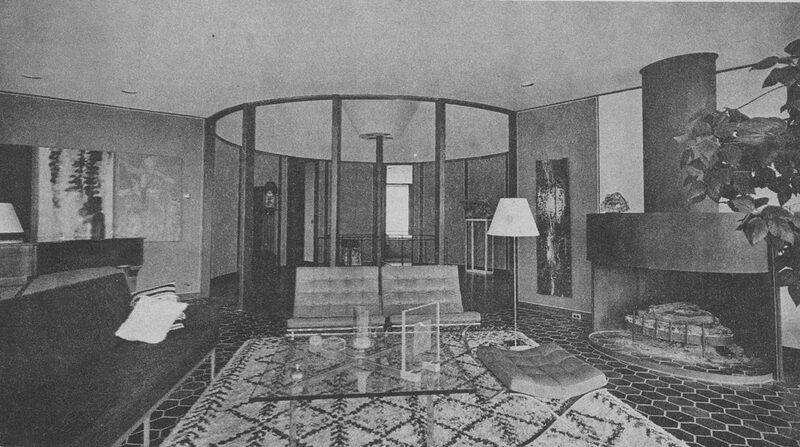 They divide the living room from the rotunda. And they do it decoratively. Cold winds howled about Foster House on the day of my visit. The counter-balanced structure stood steady. Like a merry-go-round, it rotated. But it never once swayed. Using his three rings of power, architect Foster has created strength and beauty.